SEATTLE — Committee for Children (CFC), the global leader in research-based social-emotional learning (SEL) education, has come up with a fresh new way for parents to teach kids how to use their bystander power to help stop bullying. 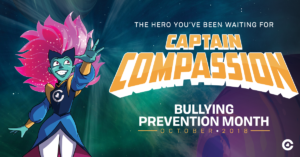 In support of National Bullying Prevention Month this October, CFC has created a bullying prevention superhero named Captain Compassion who will debut October 1. She and her trusty sidekick, Kid Kinder, will be focused on teaching bystanders—through a series of comic strips—just how powerful they are, and just how much good they can do in this world by recognizing, reporting, and refusing bullying. Equipped with the superpower to inspire others to be kind and respectful in the face of adversity, Captain Compassion is an engaging character that parents can use to help communicate the approachable, research-based information Committee for Children has curated on their brand-new bullying prevention site, CaptainCompassion.org. In an effort to educate and empower parents to speak to their children about bullying, CaptainCompassion.org will house research-based tips, tactics, kid-friendly infographics, and videos that provide adults and children with resources to help inform and inspire them to activate their bystander power. Website visitors will be invited to “take the pledge” to recognize, report, and refuse bulling. When they do, they’ll gain access to free Captain Compassion digital swag like downloadable posters, a secret decoder wheel, printable coloring books, and more. The campaign also includes a celebrity spokesperson. CFC has partnered with Disney Channel star and anti-bullying activist Skai Jackson on a public service announcement that will be distributed nationwide to coincide with Bullying Prevention Month. Jackson joins the campaign in hopes of elevating awareness about an issue she’s experienced firsthand. For more information and to access the CFC’s Captain Compassion resources, visit CaptainCompassion.org. Committee for Children is on a mission to ensure children everywhere can thrive emotionally, socially, and academically. Best known for our innovative social-emotional learning (SEL) curricula that blend research and rigor with intuitive program design, we empower children and their adults with skills that help them realize their goals in the classroom and throughout their lives. Since 1979, we’ve been connecting experts in the field to share experiences and advance the cause of educating the whole child. A force in advocacy, we’re helping pass policies and legislation that place importance on creating safe and supportive learning environments. Today our social-emotional learning and child safety programs reach more than 14 million children in over 70 countries worldwide. By lifting up children today, we’re helping them create a safe and positive society for the future. Learn more at cfchildren.org. Connect with Committee for Children on Facebook, Twitter, and Instagram.